A special disability trust is a special type of trust that can be created for a child who is under a special disability by someone who is alive or it can be created by operation under a Will. A special disability may hold a maximum value of assets of $596,000.00, which is indexed up each year. In calculating whether or not a child who is under a special disability is entitled to social security, the assets held in a Special Disability Trust are excluded from the calculation. Therefore, the existence of a Special Disability Trust may mean the difference between a child receiving social security and other services from not-for-profit organisations or a child not receiving social security and thus not receiving various services from not-for-profits. There can only be one special disability trust for each child. Therefore, a Will providing for a disabled child should be drafted thoughtfully providing for a possible contribution to be made to a Special Disability Trust, or a Special Disability Trust to be formed under the Will. 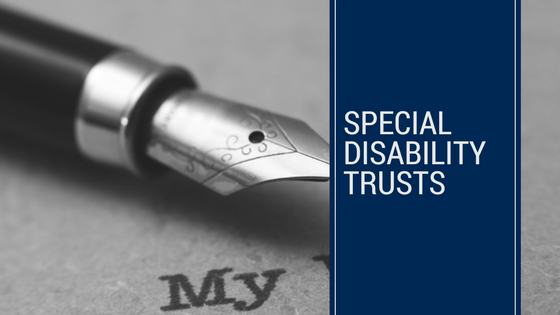 It is not our recommendation to lock in amounts under Wills that will go into a Special Disability Trust but to provide executors with discretions to contribute to or establish a Special Disability Trust. Locking things in, in strict percentages or amounts that go into a Special Disability Trust before you die may produce bad outcomes. Firstly, the definition of “special disability” may be altered and the child may not be entitled to have a Special Disability Trust or inadvertently contributions above the threshold may be made to the trust. Therefore, a thoughtful and flexible Will should be drafted allowing for the utilisation of a Special Disability Trust as part of the solution.